This light and fluffy choux cream - like makeup base creates baby choux skin with its moist inside and soft smoothness on the outside. This comes in a semi transparent glass jar. Pretty cute right! It comes in a box and supposedly there is a spoon in it to scoop out the product. Unfortunately, I don't get the spoon! :( The texture pretty much reminds me of the famous Urban Decay Primer Potion. Like seriously, but I tested if its really similar to the primer potion, I use it on my eye lid. but nope. Although the texture is the same, but it does not act like a eye primer. Definitely it is only for the face. As I applied it, my face feel kinda matte, but not really matte. A lil powdery also another finishing feel to it. 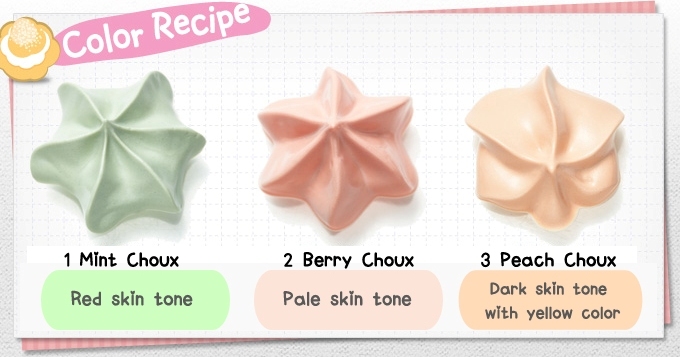 Mine is the Berry Choux, the peachy color to this base does help correct my skin tone and looks healthier and brighter. During humid days, my faces tends to get oily and this does not really help. My pores around my nose kinda appears bigger. I love to use this during the night. This does feels a lil heavy on my skin actually. Most people kinda love this, Well I love it only during the nights. It have a very sweet scent to it, and I think it kinda really match the theme of the collection. Interesting.. Want to try this out also.. The packaging is too cute!